The full botanical name used in plant taxonomy for Dwarf Deutzia is Deutzia gracilis 'Nikko.' The genus name, Deutzia is pronounced DOOT-ze-a. There is no widely used common name for plants in this genus, so people just use the genus name instead of a true common name (I don't capitalize it in such cases). 'Nikko' is the cultivar name. Botanically, the plant is classified as a deciduous shrub. However, it has a landscape use that you might not associate with a plant labeled as a "shrub" (see below under Uses in Landscaping). This bush belongs to the hydrangea family (another common shrub that you may not know belongs to this family is mock orange). 'Nikko' reaches just 2 feet high at maturity (with a spread of 5 feet). This qualifies it for dwarf status. Indeed, what sets this shrub apart is its compact stature. 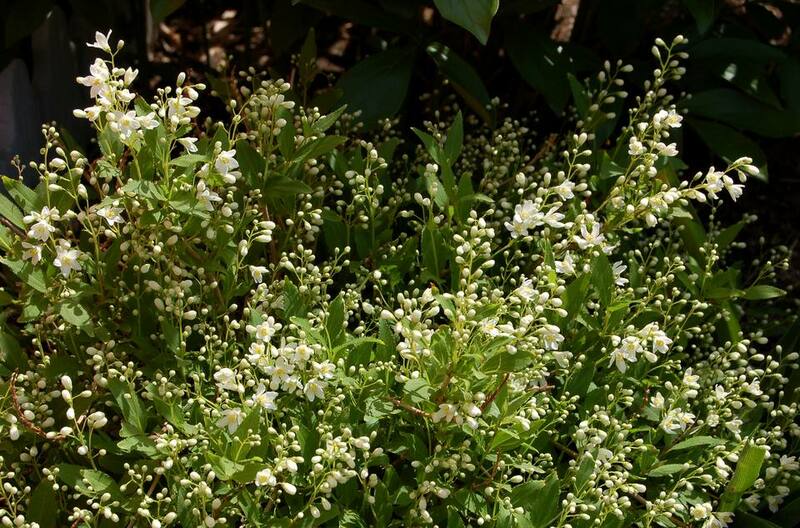 It bears clusters of double, white blooms on arching stems when it flowers in late spring. Just as importantly (for those of us seeking four-season interest in our landscaping), its leaves reportedly morph into a nice burgundy color in autumn, making it a good fall-color shrub. I have not gotten good fall foliage out of mine yet, but that may be due to infertile soil or a lack of water. Grow dwarf deutzia in full sun to achieve optimal spring flowering and fall coloration. The soil in which mine grows drains well, but it is also considered clay-tolerant. Keep it evenly moist. This bush can be grown in planting zones 5-8. Regarding geographical origin, the species plant, Deutzia gracilis is not native to North America; it is indigenous to the Far East. How Do I Care for Dwarf Deutzia? Other than watering the plant, care consists mainly in pruning it. The correct time to prune dwarf deutzia is right after it finishes flowering since it's one of the shrubs that bloom on old wood. See my full article for more information on the best time to prune shrubs. Deutzia derives from a man's name. According to Ohio State University (OSU), that man was Johann van der Deutz, who was a patron of the botanist, Carl Peter Thunberg (1743-1828). Thunberg was a student of Carl Linnaeus, who is responsible for the system of scientific plant names that we still use today. But Thunberg is famous in his own right. Does Berberis thunbergii sound familiar? It should. That's the Japanese barberry shrub. It's not the only plant named after Thunberg, who was one of the great Western plant explorers who collected specimens in the Far East. The specific epithet, gracilis is a Latin word meaning "slender" (we also get "graceful" from it). So what is slender about this shrub? It's stems, according to OSU. In fact, the bush is sometimes referred to commonly as "slender deutzia." You may recognize 'Nikko' as the cultivar name of another plant, as well: namely, 'Nikko Blue' bigleaf hydrangea. Like Deutzia gracilis, it hails from the Far East. Nikko is the name of a city in Japan. Given its compact growth habit, dwarf deutzia is a natural fit for landscaping in small spaces, where the homeowner may lack sufficient room to grow a larger bush.